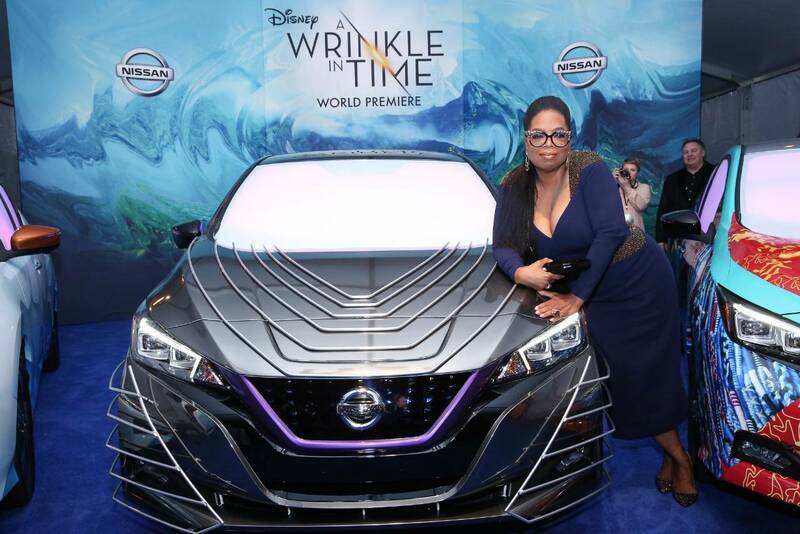 The blue carpet for the world premiere of Disney's A Wrinkle In Time was made extra special by Nissan, an official sponsor of the film and event, when three Nissan LEAF vehicles were customized and put on display. The Nissan LEAF cars, already environmentally friendly and technology advanced vehicles, were specially designed to match the theme of Disney's inspirational and diverse adaptation of the classic A Wrinkle In Time novel. Each was made to match the look of the film's three Misses: Mrs. Who, Mrs. Whatsit, and Mrs. Which. They each feature custom touch-sensitive screens covering the windshield and side windows to create an interactive light show that mimics the “wrinkle” effect from the new movie. Additionally, the show vehicles are outfitted with heat-sensing cameras to track approaching users and react when they draw near. Check out some photos of the vehicles below! Like the A Wrinkle in Time movie, Nissan is very focused on achieving a diverse workforce and customer base. Ahead of the film's premiere, the car manufacturer not only hosted a hackathon with the Black Girls Code group to celebrate the young women's achievements, but also awarded $100,000 and a brand new 2018 Nissan LEAF to a speechless Ciara Bonifice for her efforts in creative and tastefully relevant filmmaking. Tucker also promised the young filmmaker Nissan would additionally provide cars for Bonfice's film and help her premiere the film she creates with the money in any way she sees fit, ahead of accompanying her to the A Wrinkle in Time premiere. Disney's A Wrinkle in Time hits theaters on March 9, 2018.